We inherited several pieces - large tray, veggie servers, small bowls, candlesticks, etc. from Polish grandmother, who married an American in Warsaw in early 1920's. They got number of silver pieces for wedding presents. Also, in the 50s in the US she worked in the silver department of a big department store in Wash. DC. The pieces we've inherited seem to be Russian, but I can't identify the Kokoshniks. One would hope that with that background they are "real" pieces and not "fake". One Kokosnik (found on several of the pieces) seems more "refined" than those in the reference pages here. I'm showing two examples below. - The first is on the bottom of a serving dish with a mishmash of other marks. The Kokoshnik faces left and seems more "feminine" than images on this site. Also, there is the number 2 to the left of the lady's head and a small w to the right. To the left of it is a separate left-facing Kososhnik by itself in a circle. - On the very small container (for salt?) there is a 3 instead of a 2 in front of the Kokoshnik (along with some other seemingly "non-standard" marks). Note a right-facing Koshosnik by itself to the left of the one with the 3. Also, note that the shape surrounding the main Kokoshniks is different from those posted ion this site. Instead of an oval, the ones on my pieces have a curved top and a curved bottom, but straight ends. BTW, There are different assay marks on our pieces and dates range from 1844 to 1894...if I'm reading them right. Since these are not nice, neat standard marks, they give me the feel of change...changing regulations, changing regimes, changing...???? Or just fabrication? You shouldn’t show two different items in the same thread. It might cause confusion. Read the rules please. Anyway, here is a primary explanation of the marks. 1. The round mark showing a woman’s head looking left is a Polish warrant mark (1921-1963), punched on silver objects made of several parts. It is always punched beside the official Polish hallmark making it legal for trade in Poland. See below. 2. This mark you probably believe is a Russian kokoshnik mark, is actually the official Polish hallmark (1920-1931) Number 2 tells us that the silver purity is not less 875/1000. Behind the neck is a Latin letter but it is too unclear to read. What letter is it, it tells us the town? 3. I’m not sure what the AW-marks stands for. Probably the Polish importer? 1. The Russian official hallmark showing the Cyrillic letters ДТ (DT) above 1844. The letters stand for the Russian assayer Dimitry Tverskoy, active in St. Peterburg 1834-1851. The figures 1844 is the assaying year. 3. The third mark is also destroyed but most likely it is the maker’s mark. 4. The last round mark is the town mark of St. Petersburg in Russia. 1. A Polish transitional mark (a man with a feathered cap looking right) is punched on objects wearing old Austrian or Russian hallmarks. 3. The hexagonal mark shows ”Diana Kopf” the Austro-Hungarian (or Austrian) hallmark for the fineness of not less than 900/1000. This is strange because there is an 800- fineness mark punched ??? Is it an Austro-Hungarian or Austrian mark is difficult to say, the mark is too worn. 4. W.J could be the Austrian maker? Somebody else might fill in the rest if I forgot something. Hopefully the explanation satisfies you. Ups, sorry didn't notice. The w stands for Warsaw in Poland. Wow!!! Thank you so much! This makes so much sense. Since I didn't find a listing of Polish marks on this site (unless I missed them? ), I was assuming that the items came from a time in history when Poland was a part of Russia. Is there an online site that shows Polish marks? Sorry for the concern on posting two items. It "made sense at the time", because my focus was on showing examples of what I thought was KoKoshnicks. Shows how easy it is for a total novice to get confused! Thank you again so much for this information. Wow! So very interesting. 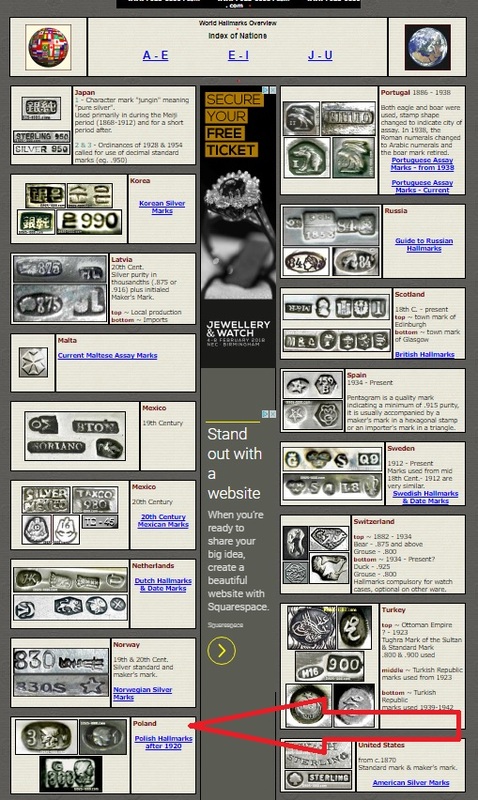 Ummm, I just did a search on Polish Hallmarks and pulled up a page on this site!!! Why is it not indexed under the World Marks? Anyone know? In 1795 Poland ceased to exist for the second time. It was split between Russia, Prussia and Austro-Hungaria. In 1918 it achieved its current independence and the Polish marks are from that period. How could you both miss it? Poland is, and always was, listed in the World Hallmarks section. Yes Poland is where you show it I know that but it cannot be found here, where it logical should be. Click on "World Marks" and I will be surprised if you find Poland in the index. That is the point. By the way why are manufacturers listed here, they have no hallmarks but makers' marks (Jensen Christofle etc.)? I must specify a bit. If you see some countries among manufacturers listed on the pull down menu but not all you must to realize to click on World Hallmarks again on the pull down menu. It is no logical. Therefore torysemo was confused. When you click on 'World Marks', a secondary title of 'World Hallmarks' appears, just click on that. The initial title is 'World Marks', not 'World Hallmarks', that is why some manufacturer's marks are listed. OK, OK so be it but still confusing in my mind. Thanks folks. Yes, it is confusing - for novices at least. However, having worked on developing directories before myself, I realize that what seems obvious to some (the developer) is clear as mud to others (everybody else). lol Also, since my "middle name" is "oblivious", according to those who know me (or as my Mom used to say, "if it'd been a snake, it would have bitten you. "), I'm not surprised that I missed the World Hallmark section.